The way we have been taught to think about ourselves and the world is out of alignment with all that is natural and normal to us—love. This training, or programming, is the cause of all our unhappiness and preventable illnesses. The time has come for us to remember the truth about ourselves—that we are not the programmed mind—we are so much more. It is time for us to correct our training and heal our lives. The voice wasn’t coming from my mind, it was coming from a deeper, more authentic place. It was coming from my heart center—from my soul self. It was a calm voice that was telling me the truth about my life. I didn’t ignore it—I couldn’t ignore it. This was a massive life-changing experience. I haven’t been the same since and I knew I needed to tell other people what I have remembered. Amazingly, not long after that, I was approached by a spiritual medium who said the universe had a message for me—it was time to write the book I came here to write. Perfect timing—as usual. From life events, I am moved to write an article for my weekly column in Viva Glam magazine, my blogs or to jot down a note or two for my next book (already in the works). I learn about myself from the observing and writing process—it’s truly eye-opening, and sometimes a little shocking. I typically outline the article, blog or book essay with subheadings and make notes under each regarding the two to three points I want to make. This has helped make certain that the material matches the heading. However, my writing often takes its own course and shifts in a different direction from originally planned. I love this part of writing—true, authentic creativity—easily fixed with a new subheading. I then read the piece aloud, make corrections and move to the next section. Writing is like art in motion. Although I was doing just fine as a risk manager, I have always had an interest in writing. When I was 12, I started writing a book about how silly humans are—the way we act, the way we treat each other and the way we treat ourselves. I spent an entire summer hunting and pecking my way through a light blue Smith-Corona typewriter using the back side of discarded paper from my dad’s business. At the end of the summer, I put my manuscript in a folder and put it away for safe keeping. In high school, I was the feature editor of the school newspaper and my full-page articles were the subject of history classes and journalism classes at my school. Later, as a safety professional and a risk manager, I had been published many times in corporate newsletters and industry magazines. I also had an aunt, Marian Glick, who was a pioneer in women’s journalism and the editor for Walter Cronkite at CBS for nearly 30 years. I think she always wanted me to be a writer—or maybe she always knew I was going to be one. About seven years ago, I was volunteering as an animal communicator at Serendipity Stables (York Center, OH)—a place where the horses help anyone with trauma or drama in their lives. 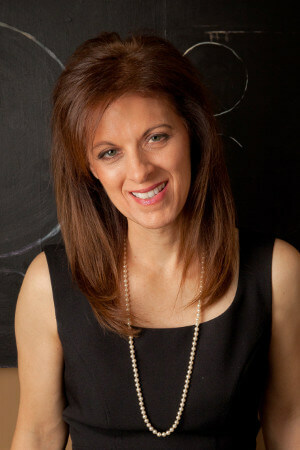 A spiritual medium (Lisa Noland-Shalosky) said she had a message for me from the universe. The message was—it was time to write the book. That message struck an authentic cord within me. I knew in my heart I had come here to write and it was time to write the book I had started so many years ago on my Smith-Corona. Mood, Food and Gratitude: Healing from the Way We Think was born that summer. Up early with a fresh cup of organic tea in my office to begin writing. I take breaks to answer emails, check in with my staff at a risk consultancy firm I own and then get to the business of promoting the book. I also hit the gym at some point or take in a little yoga. I spend a little time each day educating the Facebook community about animal abuse in factory farming, product testing and animal tourist attractions and suggest changes that can make a difference and protect the animals. Then, early to bed with some deep breathing…and morning comes. Writing feeds and soothes my soul. When I write, I feel at home in my authentic self. I feel free and creative. I also love hearing people’s comments about the book or articles. They have interesting stories to share about their life struggles and often point out something in the book or an article that helped change their life, that saved their life or really clicked with them. It is super humbling. Dr. David Hamilton is a key person who has inspired me with his creativity, presentation style, interesting venues and his kind, informative and fun talks. He is a truly authentic soul. I have also been inspired by Don Miguel Ruiz. His books, The Four Agreements and The Book of Knowledge, have had a strong impact on my life. Of course, my Aunt Marian was an inspiration as a world-class journalist, but it’s my mother who has been the greatest inspiration in too many ways to mention here. She’s my rock. Last year, I made a pact with myself that every vacation I go on must be centered around a local animal/dog rescue so I can volunteer to help the animals and give them lots of love. Of course, I get lot of love, too! 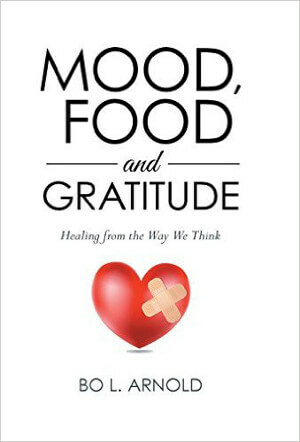 I am promoting Mood, Food and Gratitude: Healing from the Way We Think and will continue to do so through book signings, radio/TV interviews and speaking engagements. I am also sitting down to write my second book—I can’t wait to present it to everyone. It is going to be a blast to write—and read. I’d like to thank all the people who have read the book and articles, loved them and shared them with others. Your generosity, support and love are unmatched! I want to thank NFAA! I am so grateful to have found this association. It has been said that writing is a lonely business, but now I feel I have a community where I can improve all aspects of writing, editing, publishing and promoting!